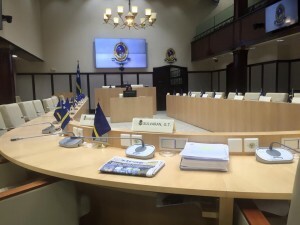 WILLEMSTAD – According to the Council of Advice (RvA) it is not possible to suspend a suspicious Member of Parliament who has not yet been finally convicted. This cannot be done simply by adopting a Country Ordinance, but the Constitution must be amended for this to be possible. The RvA indicated this recently in their advice on the bill Ordinance Revocation Membership Parliament. The initiators of this bill aim with this bill to suspend MPs who have been convicted of a crime or who are in jail awaiting their trial in court. The current coalition, especially the yellow party PAR, is in favor of amending the Constitution. The only issue is that a two-thirds majority is needed in Parliament to adopt any changes made to the Constitution.